We have many open volunteer positions. Don't see anything that you like? Contact the FFA and we will find a job that works for you!! Just want to be there when we need you? We can add your name to our one-time helpers list. Please contact the FFA President, Diane Hunter or the FFA Volunteer Coordinator, Krista Dwyer, to volunteer or for more information. The FFA is currently looking for the following positions for the 2018-2019 school year. We are looking for a Restaurant Night Coordinator for next year (2019-2020). Reach out to local restaurants to schedule a night of profit-sharing; obtain flyers; and publicize our restaurant nights to the school community. Email mrevolunteercoordinator@gmail.com for more information. The FFA Fundraising Coordinator works with the FFA Executive Board to plan, coordinate and implement strategies to develop campaigns and contributions to support the FFA and works directly with fundraising committee chairpersons to maintain accountability and compliance standards for FFA events. Time commitment: Varies greatly, 1 hour FFA meetings per month and providing support to committees involved in fundraising throughout the year. The Yearbook Treasurer is responsible for advertising sales, preparing and distributing flyers (online) for sale of yearbooks; posting yearbook sale information on website; counting money and preparing deposits with assistance of yearbook chairperson on a pre-arranged schedule during an approximate 2.5 month period (April thru mid-June) of yearbook sales. Reports money totals to yearbook chairperson and FFA. Time commitment: 1 hour a day for approximately 10-15 days throughout yearbook sales period. Singing, dancing, musical instruments, magic, comedy, martial arts … if you love our annual variety show and want to see it continue, please consider volunteering as our show coordinator for next year. Responsibilities include setting the date, booking the venue, coordinating auditions, selling tickets, running the rehearsal, and making sure things go smoothly the day of the show. You don't need to do it alone but we do need someone to take the lead. Job shadowing begins next month with auditions for our upcoming variety show in May. Email mrevolunteercoordinator@gmail.com for more information. The FFA Parent Liaison coordinates & communicates with Room Parents to send announcements out to classroom parents. The Parent Liaison also leads our Room Parent orientation in September, keeps our Room Parent Handbook up to date, leads school tours for new families each month, and helps to recruit volunteers when needed for school events. Would you like to help keep our families informed about what's going on at Miramar Ranch? Our 2019-20 Parent Liaison might be the job for you! 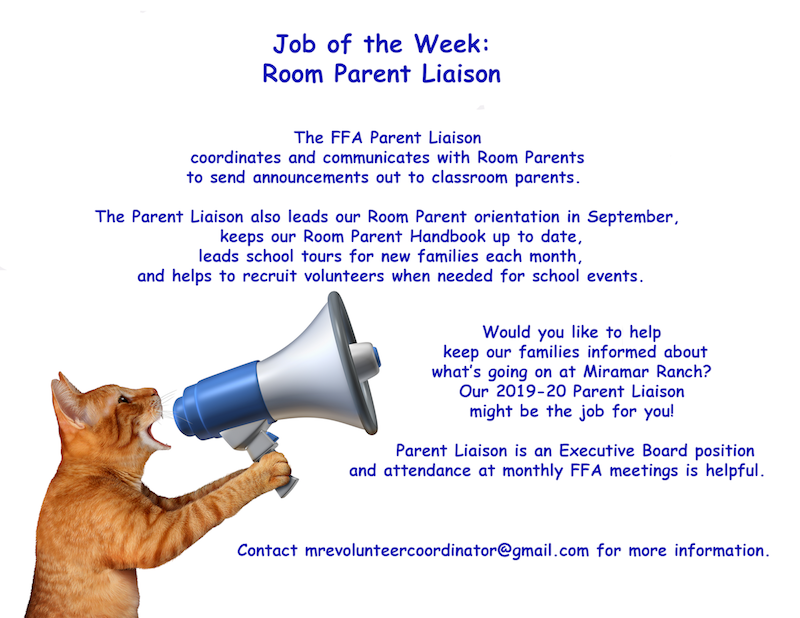 Parent Liaison is an Executive Board position and attendance at monthly FFA meetings is helpful. Contact mrevolunteercoordinator@gmail.com for more information. We are looking for a volunteer to plan & host our school wide assemblies in 2019-20. Help select and schedule music, science, dance, and inspirational and educational shows for our students. Coordinate logistics with the front office and school staff, and be on-hand during the shows to offer assistance as needed to our performers. Email miramarranchassemblies@gmail.com for more information. 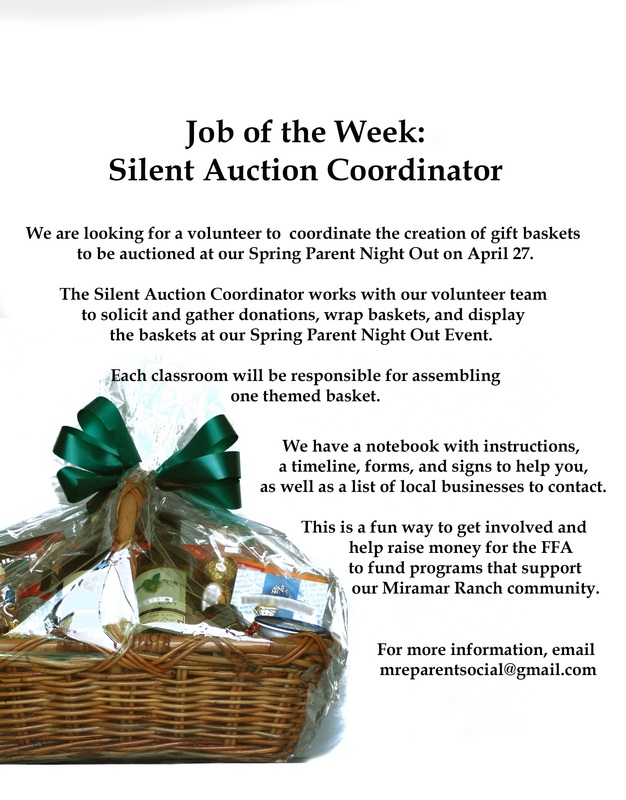 We are looking for a volunteer to coordinate the creation of gift baskets to be auctioned at our Spring Parent Night Out on April 27th. The Silent Auction Coordinator works with out volunteer team to solicit and gather donations, wrap baskets, and display the baskets at our Spring Parent Night Out Event. Each classroom will be responsible for assembling one themed basket. We have a notebook with instructions, a timeline, forms, and signs to help you, as well as a list of local businesses to contact. This is a fun way to get involved and help raise money for the FFA to fund programs that support our Miramar Ranch Community. The FFA Secretary attends monthly FFA meetings, takes attendance, and keeps the official minutes. Do you want to significantly help the school without having to be on campus a lot? Then the treasurer position might be for you. We are looking for a treasurer to take over next year (June 2019 – May 2020). The FFA treasurer keeps permanent books of account and records items of gross income, receipts, disbursements, funds received and deposited, and outstanding financial liabilities of the FFA. The treasurer is responsible for the proper accounting, handling and control of cash or other negotiable funds received by the FFA, pending deposit in our FFA account. Shadow our current FFA treasurer this year so you can hit the ground running next summer. Got computer and website skills? The FFA desperately needs someone with a rudimentary knowledge of newsletter/email blast production & website maintenance to serve as our FFA Communications Officer next year (the 2019-2020 school year). Much of the work can be done off site and the website maintenance portion can be job shared. On-the-job training is included. Email mreffawebsite@gmail.com for more information. We need a volunteer to spearhead our annual Teacher & Staff appreciation week May 6-10. Solicit potluck items via web-based signup sheets; organize flower sales; coordinate door decorations and posters. Encourage students and parents to let our teachers and staff know how much they are loved by suggesting easy ways to celebrate and honor them. Our outgoing volunteer can offer training and support. Want to play a key role at the best Halloween Carnival in town? The Games Chair is where it’s at! We're looking for a Halloween-loving volunteer (or two!) to provide organization and support to the games used at the Miramar Ranch carnival. Some games are rented but most are owned and stored on site. Some games require supplies to be purchased each year, and some games are completely set to go. Got some new ideas? You can even invent and build your own carnival games! We need a team to prepare for the carnival in the months before and help assist the game booths the day-of. If you are interested, please consider shadowing the Games Chair this year to be prepared for next year. There are many parts and pieces to this position, but when it all comes together, it's AMAZING! Contact Natalia Moorhead to inquire: natalia.rissolo@gmail.com. But act now! The carnival is only two weeks away! Happy Haunting!